During this holiday season, Humanitarian Support Foundation teamed up with the Salvation Army to visit a local assisted living facility. Christmas carols were led by volunteers while the residents of Harmony Hall Assisted Living sang along. The fun-filled festive day was full of laughing, smiling, and concentrating on the meaning of Christmas. Aside from the joyous spirit of spending time with one-another, the Harmony Hall residents also received gifts in the form of: slippers, robes, shirts, sweaters, toboggan, gloves, and a gift basket. 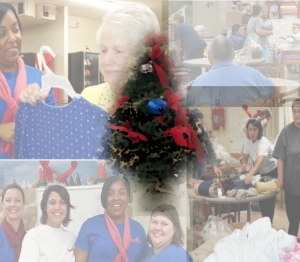 Humanitarian Support Foundation and the Salvation Army volunteers worked hard to spread joy and compassion with Harmony Hall during the 2013 holiday season.